will know how to identify and combine natural building materials, such as clay-soil, fibers and sand, as well as round wood and stone. will be able to construct their own cob cottage. This includes foundations, windows and doors, electricity and plumbing and roofing. will be proficient in applying earthen plasters and earthen floors to a variety of surfaces, such as cob, concrete, wood, gypsum, etc. can construct an earthen oven, as well as other fire related applications. can effectively remodel and renovate ancient buildings as well as poorly constructed modern building, using natural earthen materials. will be able to design and re-design their own buildings/spaces so that they may provide a deep sense of belonging. During these 3 weeks, the entire “House of Earth” curriculum will be covered. We will constantly nurture a deep understanding of the building process and focus on skill development that creates the confidence you need. The bulk of the building activities will take place before lunch and in the late afternoon, with a generous break during the middle of the day. (think swimming!) There will be two- 36 hour breaks during the 3 weeks, giving students an opportunity to explore the area. 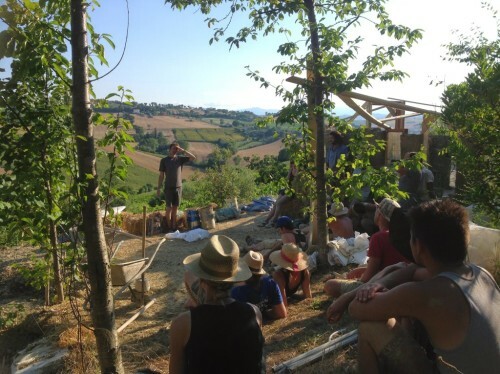 The workshop takes place on an ancient farm site, dotted with stone structures, some more than 500 years old. It has a renovated main house with modern facilities. Although summers in Italy can be hot, here we have the gift of trees and shade, elevation (1600 feet, 500 meters) and the nearby river Gotra, which provides for amazing swimming opportunities. Within the 3 weeks we will plan a few days off, during which students may want to explore the Italian Riviera, just a 45 minute drive away. The food will be provided by chef Giulia Rubertelli (from nearby Parma). She is an artist in creating simple, delicious meals and aims to bring you local specialties as well as world cuisine. She, whenever possible, insists on using fresh, local and organic ingredients. Most meals will be vegetarian (with options for vegans). Students will be provided a camping spot in the shade, with composting toilets and warm showers available nearby. The site can be reached by train and bus. the nearest regional airport is Parma and the nearest international airports are Milan and Turin. We are always happy to help you coordinate your travel plans to and from the site.